Known for cutting edge storytelling and introducing exciting new characters to Genre Fiction, Pro Se Productions announces the debut of the first volume of a two fisted, hard boiled crime reporter like no other-SENSIBLE REDHORN, created and written by Tim Holter Bruckner. Acts of torture, murder, and blackmail grip a city. And the man drawn to it, beckoned to observe and report on it, is the only one who may be able to stop it. Sensible Redhorn, a six foot six, three hundred pound crime reporter for the Flashburn Times, has seen evil like no other. And when that evil wrenches its way into the lives of the people closest to him, he’ll do whatever it takes to keep them safe, regardless of his first name. 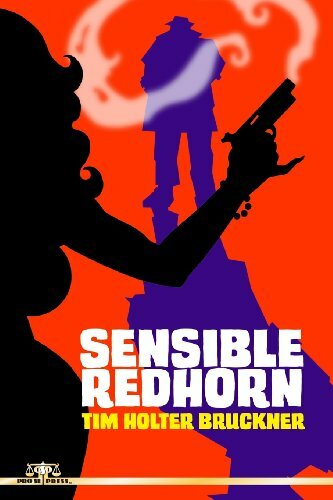 SENSIBLE REDHORN by Tim Holter Bruckner collects four adventures of the crime reporter living on a razor’s edge. A colorful cast of eccentric characters also brings humor, intrigue and passion into each compelling tale. A sadistic crime boss hell bent on addicting children to a lethal, flesh rotting drug. An armless man who perverts his own young offspring to a life of crime and murder. The ex-wife of his best friend who is willing to risk the lives of those once dearest to her for corrupting wealth. The return of an estranged brother determined to wrest the highest cost of revenge. In the center of this maelstrom of malevolence, Sensible Redhorn stays true, steady and determined. Committed to his friends, committed to fairness, committed to the truth. Even if it kills him. A noted sculptor and artist, this is Bruckner’s first foray into Fiction. This first collection features a stylistically stunning cover by the author, as well as cover design and formatting by Sean Ali and Ebook formatting by Russ Anderson. Pro Se Productions proudly presents SENSIBLE REDHORN by Tim Holter Bruckner. A hard boiled nourish tale of a double barreled wordslinger ready to give it all to protect those close to him. Available at Amazon and Pro Se’s own store (www.prose-press.com) in print and as an Ebook at Amazon, Barnes and Noble, and Smashwords. If you are a reviewer interested in receiving a digital copy for review or for any questions, interviews with the author, or other business, please contact Morgan Minor, Pro Se’s Director of Corporate Operations at MorganMinorProSe@yahoo.com. For more information on Pro Se Productions, go to www.prose-press.com and like Pro Se on Facebook at www.facebook.com/ProSeProductions.